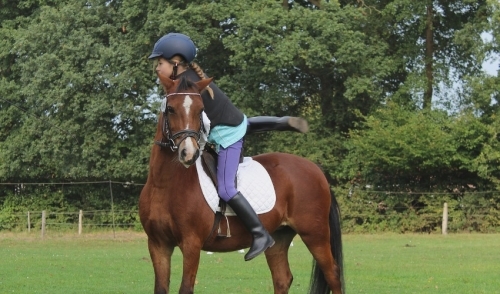 Have the horse stand still and remove your feet from both of the stirrups. Put both of the reins in your left hand with enough tension to stop the horse if it tries to move forward. With your hands just in front of the horse’s withers, move your weight towards your arms. After that, swing your right leg over the saddle and slightly push yourself away from the horse so you don’t go near the equipment or his legs. To help with the shock of hitting the ground with your feet, bend your knees as you land. Now that’s you’re off, you can safely lead the horse where you need it to go.